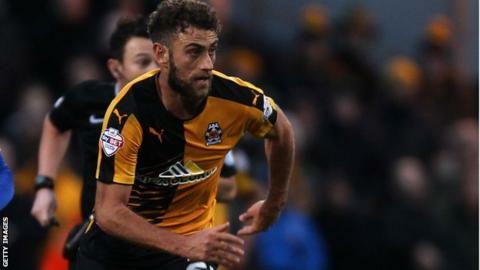 Ben Williamson bagged a brace as Cambridge inflicted a first defeat on new Leyton Orient manager Kevin Nolan. Williamson capitalised on Frazer Shaw's tame back pass to round O's keeper Alex Cisak and slot the ball home. The visitors struck again through Williamson's low drive before Orient pulled one back through substitute Armand Gnanduillet's neat finish. Jimmy Spencer buried Williamson's cross on his debut to seal victory for the U's, who climb to 11th in League Two. Nolan had started with two victories for the O's after being appointed on 21 January. His side drop three places back to ninth, two points above Cambridge. "We were very sloppy. You don't want to gift a side who've come to your turf a goal and that's what we did. "I've said to the lads, when you're playing at this level you can't afford to make mistake after mistake after mistake because if you do that you're going to get punished and we did. "I don't think it was through Cambridge's great play, I think it was through us not doing what we've done over the last two games." Match ends, Leyton Orient 1, Cambridge United 3. Second Half ends, Leyton Orient 1, Cambridge United 3. Attempt missed. Kevin Nolan (Leyton Orient) right footed shot from the left side of the box misses to the right. Frazer Shaw (Leyton Orient) wins a free kick in the attacking half. Armand Gnanduillet (Leyton Orient) wins a free kick in the defensive half. Attempt saved. Blair Turgott (Leyton Orient) right footed shot from the right side of the box is saved in the centre of the goal. Connor Essam (Leyton Orient) wins a free kick in the attacking half. Foul by James Spencer (Cambridge United). Substitution, Cambridge United. Robbie Simpson replaces Harrison Dunk. Foul by Nigel Atangana (Leyton Orient). Attempt saved. Ben Williamson (Cambridge United) left footed shot from the right side of the box is saved in the centre of the goal. Corner, Leyton Orient. Conceded by Josh Coulson. Attempt blocked. Armand Gnanduillet (Leyton Orient) right footed shot from the centre of the box is blocked. Kevin Nolan (Leyton Orient) wins a free kick in the attacking half. Substitution, Leyton Orient. Kevin Nolan replaces Jack Payne. Attempt missed. Luke Berry (Cambridge United) right footed shot from the centre of the box misses to the left. Corner, Cambridge United. Conceded by Connor Essam. Goal! Leyton Orient 1, Cambridge United 3. James Spencer (Cambridge United) right footed shot from the centre of the box to the bottom right corner. Assisted by Ben Williamson. Attempt missed. Jack Payne (Leyton Orient) right footed shot from the centre of the box is too high. Substitution, Cambridge United. James Spencer replaces Ryan Donaldson. Corner, Leyton Orient. Conceded by Lewis Page. Substitution, Leyton Orient. Blair Turgott replaces Calaum Jahraldo-Martin.